I took this shot whilst on a boat with fishermen in Cape McLear, Malawi. 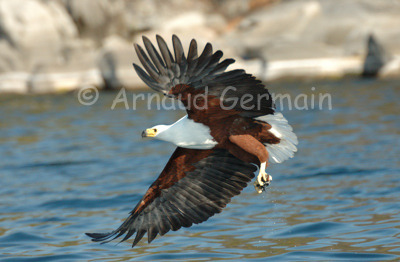 Once the fishermen get the attention of the fish eagle, they throw a fish in the water. I had to be very quick to get a series of shots as the bird swooped in front of the boat, grabbed the fish and then disappeared to eat it. To add a few problems, the boat we were using was very small and was rocking quite badly everytime somebody was moving.